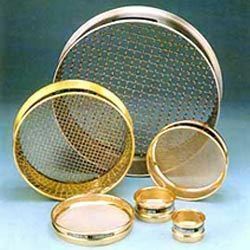 We are a leading Exporter of sieves shaker, laboratory sieves and s.s. lab test sieves from Mumbai, India. Sieves shaker used in research and development, quality control of raw materials, as well as in production monitoring. the heavy cast iron unit. The motor actuates a eccentric weight, thus producing uniform motion an sieves table; which is equally balanced mounted on helical springs. The uniform vibration on sieve table can be control by speed regulator and imported mechanical timer to set required time for sieving analysis. 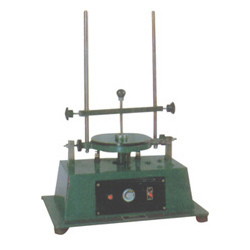 Variable amplitude (vibration) on sieves table can be adjusted with the help of speed regulator. Only dry sieving suitable for 4 mm to 37 micron. Accommodate only upto 8" (200mm) dia x 2" (50mm) height. Maximum 6 nos. Plus upper lid and bottom receiver. Construction : The frame is made out of spun brass and without any joint in it. A clean rigid design of minimum weight and free from corners where the material could be lodged. Uniform fabrications of our sieves permit easy and smooth nesting on each others and also with lid and receivers. Imported stainless steel 18/8 quality or Phosphor Bronze standard sieve cloth is used for batter performance and lasting. An essential feature of test sieves is that the mesh should be flat, taut and uniform and with permanent tension round the whole circumference. We are offering a quality range Lab Test Sieves, which are widely appreciated for high consistency, fit and stable functions. Looking for Laboratory Sieves ?